April is an exciting month for the Dairy Cattle Reproduction Council (DCRC). It’s the month where we accept Scholars applications and Herd Repro Award nominations. We just launched the DCRC Scholars program earlier this year. This award provides one travel scholarship to a full-time graduate student who is focusing on some aspect of dairy cattle reproduction. The award recipient earns an expense-paid trip to attend the DCRC Annual Meeting, Nov. 13-14, in Pittsburgh. To apply for the DCRC Scholars program, applicants must complete the application form, submit an interest statement that details the applicant’s interest in dairy cattle reproduction, career goals and research project(s), and provide a letter of recommendation. Applicants may also share additional information, such as awards, honors and scholarships received. Eligible candidates must be a DCRC member and enrolled full time at a college or university in a dairy, animal or veterinary science, microbiology or related program at the time of application deadline, with an area of interest that includes dairy cattle reproduction. The application deadline is April 30. Applicants will be notified by June 1, regarding the selection committee’s decision. 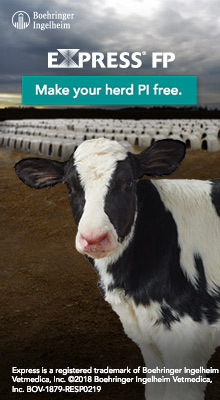 To learn more about the program and to apply, go to: www.dcrcouncil.org/dairy-cattle-reproduction-council-scholars-program. DCRC’s other award program recognizes outstanding dairy operations for reproductive efficiency and well-implemented management procedures. Judges evaluate key metrics, including voluntary waiting period, interbreeding intervals, heat detection, conception rate, pregnancy rate, value of reproduction and culling rate. Reproduction numbers are based on the 12-month period Jan. 1, 2018-Dec. 31, 2018. Dairy operations must be nominated by professionals who serve the dairy industry, such as veterinarians, extension agents, AI and pharmaceutical company representatives, dairy processor field staff and consultants. For more information about the Reproduction Awards program or to nominate a herd online, visit www.dcrcouncil.org/awards/nominate-a-herd. Nominations are due April 30. Another reminder: The core meeting dates for this year’s DCRC Annual Meeting are Wednesday and Thursday, Nov. 13-14 (not Thursday and Friday – like last year). Plan to gather Tuesday evening (Nov. 12) for an informal reception and be ready to learn and network on Wednesday and Thursday at the Pittsburgh Marriott City Center. Estrus, defined as the period of a cow’s sexual receptivity, is associated with behavioral changes that occur for 3 to 16 h, with varying intensity. As milk production increases, behavioral signs of estrus are reduced. A potential solution to improve estrous detection rates is use of precision dairy monitoring technologies (PDMT). In this study, Mayo et al. (2019) determined the relationship of physiological and behavioral changes peri-estrus with generation of alerts for estrus by commercial PDMT and evaluated the efficacy of estrous alerts generated by commercially available PDMT systems on the same cows. Lactating Holstein cows (n=109), between 45 and 85 days in milk, were synchronized using a modified G7G-Ovsynch protocol (last gonadotropin-releasing hormone injection withheld to permit expression of estrus) and observed visually during 30 min (4 times per day) behavioral estrus on d −1 to 2 (d 0=day of estrus). Blood samples were also taken to measure progesterone concentrations to determine the peri-estrous period. Estrous detection was compared among PDMT, an estrous behavior scoring system and visual observation of standing estrus with the reference standard (gold). All PDMT tested can detect estrus – at least as effectively as visual observation. However, 4 of the 6 commercial estrous-detection devices had greater sensitivity by correctly detecting 15 to 35% more cows than visual observation. Only 56% of cows that ovulated were observed standing by visual observation. 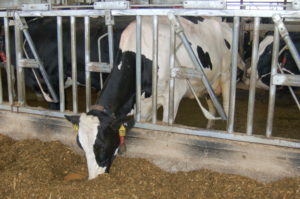 The main changes evidenced by the activity monitors on the day of estrus were an increase in activity, either as steps, motion or head/neck movements, and a reduction in rumination. Temperature was not affected and lying times differed among the different devices. In conclusion, activity, eating time and rumination are predictors of estrus in dairy cows. Additionally, some PDMT have greater sensitivity of estrous detection compared with visual observation. Silent ovulation is still a challenge for automated estrous detection systems that rely on behavior changes. The number of in vitro-fertilized (IVF) embryo transfers (ET) has increased from 26,742 in 2010 to 117,712 in 2016, and pregnancy loss after IVF is reported to be greater than that observed in artificial insemination (AI). Embryonic survival depends on interferon-tau inhibition of prostaglandin F2-alpha (PGF2α) pulses and progesterone (P4) for the establishment and maintenance of pregnancy. Human chorionic gonadotropin has a luteinizing hormone-like effect in cattle, increases P4 concentrations by stimulation of greater production of P4 by the corpus luteum, and/or by induction of ovulation of a dominant follicle forming an accessory corpus luteum. In this study, Niles et al. evaluated the effect of treatment with 2,000 IU of human chorionic gonadotropin (hCG) 7 d after AI or at the time of ET on reproductive outcomes, including P4, pregnancy-specific protein B (PSPB), interferon-stimulated gene 15 (ISG15) and pregnancy outcomes (P/AI or P/ET) in nulliparous Holstein heifers. Two experiments were performed. In experiment 1, heifers (n=261) were randomly assigned to receive no treatment (control) or 2,000 IU of hCG 7d after AI to estrous detection. In experiment 2, heifers (n=291) were randomly assigned to receive no treatment (control) or 2,000 IU of hCG at transfer of an IVF embryo after the last gonadotropin-releasing hormone treatment of a 5-d CIDR-synch protocol. Blood samples were taken from a subset of heifers on d 7, 11, 18, 20, 25, 28 and 32 of the experiment and on d 35, 39, 46, 53, 60 and 67 for P4 and PSPB. The ISG15 mRNA expression was measured on d 18 and 20. In both experiments, treatment with hCG increased P4 concentrations from d 11 to 32. Treatment did not affect P/AI or P/ET at d 32 or 67. Treatment did not affect relative ISGS15 mRNA concentrations. Treatment with hCG did not affect pregnancy loss in AI heifers. In conclusion, treatment with 2,000 IU of hCG 7 d after AI or at the time of embryo transfer increased P4 concentrations without affecting P/AI or P/ET in nulliparous Holstein heifers. Uterine diseases are known to impair reproductive performance and are often caused by retention of the fetal membranes during early postpartum. Highly regulated inflammatory processes are involved in the expulsion of the placenta and failure to release the placenta is associated with disfunction of uterine immune responses. However, the exact mechanisms by which the uterine immune function fails to regulate the expulsion of the placenta are not well understood. The objectives of this study were to identify the macrophage phenotype (M1 or M2) in the postpartum bovine uterus. Researchers compared uterine caruncles of multiparous dairy cows that during the first day postpartum either retained (RET) or had normal expulsion (NOR) of placenta. Uterine caruncles were collected transvaginally from singleton-bearing, multiparous Holstein cows between 3 and 24 h following parturition; fetal membranes expelled before 12 h were considered normal expulsion (n=5) and after 12 h were defined as retained (n=5). Immune cells were sorted magnetically from the caruncular endometrial cell fraction using a CD172a marker. Monocyte/macrophage population was characterized using flow cytometry. Transcriptional and protein expression analysis were performed on uterine caruncles. RET samples showed a lower CD14þ/CD16þ (markers for pro-inflammatory cell population – M1) expression in caruncle monocyte/macrophage population compared with NOR. As opposed to NOR, RET demonstrated greater expression of anti-inflammatory M2 macrophage-associated genes CD206, C-type lectin domain family 7 member A and RNASE6. In addition, caruncles from RET showed decreased signal transducer and activator of transcription 3 activation, an important promoter of proteolytic activity, compared with NOR. In conclusion, the study demonstrated that there is an overall lower number of macrophage populations in the caruncle of cows with RET placenta and these are polarized toward M2 phenotype. Excessive accumulation of M2 macrophages may lead to reduced trafficking of immune cells into the caruncle. Thus, this impairs the inflammatory, phagocytic and proteolytic processes that lead to placental expulsion. Most would agree that healthy, comfortable cows stand a good chance of reproduction success. Yet, how dairy producers foster animal health and create a positive cow environment varies – from housing facilities to labor management. 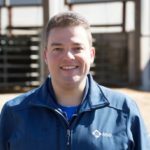 At the 2018 Dairy Cattle Reproduction Council Annual Meeting, two dairy producers – Brian Houin, Homestead Dairy LLC, Plymouth, Ind. ; and Mark Rodgers, Hillcrest Farms Inc., Dearing, Ga. – shared how cow comfort, and thus improved animal health, has evolved on their dairies. Homestead Dairy’s 2,200 cows are housed in a single, monoslope, low-profile, cross-ventilated barn, with each pen holding 180 cows. Each pen includes three robotic milkers. While cow comfort factored into installing robotic milkers, labor was the main reason the dairy invested in this technology. Unsure about future labor availability and costs, Houin said, “We decided to pay for the labor upfront.” Compared to their other facilities (double-25 and double-eight parallel parlors), labor dedicated to milking and related duties is 40 percent less. Plus, he said cow comfort improved. In August 2018, cows at the robotic facility averaged 85 pounds of milk from nearly three milkings per day. “Cows in the new facility have the freedom to move about the pen nearly 24 hours per day – seven days a week,” said Houin. The average time a cow spends away from the pen is just three hours per week. During that time, cows walk through a footbath and freshly dried manure solids are added to the stalls. Within each pen, sorting pens provide space for herd managers to perform artificial insemination (AI) and pregnancy diagnoses. Each cow wears an activity collar, which helps facilitate heat detection. Homestead Dairy follows a 70-day voluntary waiting period, without presynchronization. If estrus is not detected prior to 78 days in milk, the cow receives prostaglandin F2α. If a cow is open, she follows an every-other-week prostaglandin F2α strategy. Hillcrest Farms, with four generations working on the dairy, milks about 400 cows. Based in Georgia, alleviating heat and humidity are top priorities. 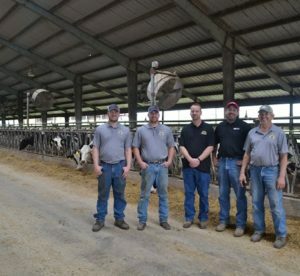 While pasture-based dairying creates a bucolic atmosphere that many consumers desire, the Rodgers family knows they can provide better cow comfort in a freestall facility. Ten years ago, they transitioned from a pasture-based dairy operation to a freestall facility. The freestall barn has an east-west orientation, with a 3-foot ridge gap and 14 more feet of roof that keeps stalls shaded throughout the day. Even the lane to and from the milking parlor is under the facility’s roof to keep the brightness and heat of the sun off cows. When the temperature hits 68 F, 52-inch fans turn on in stages. Fans move air at least 3 miles per hour. At 72 F, soakers begin releasing water for one minute, followed by a 10-minute rest. When the mercury reaches 84 F, fans run at full power and soakers release water for one minute, followed by a five-minute rest. Stalls at Hillcrest Farms measure 17 feet from rear curb to rear curb. “This gives more lunge room and dissipates heat more efficiently, especially with cows head to head in the four-row barn,” he said. The stalls are filled with clean, recycled sand once weekly, groomed daily and manure raked out of stalls three times daily. Each day, the freestall barn is flushed. Sand is captured, flushed until clean, stacked in the sun to dry and reused a few weeks later. 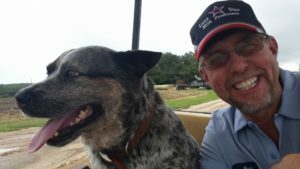 Rodgers believes confinement housing (with deep, sand-bedded stalls, grooved rubber belting on all cow alleyways, fans, soakers and feed rails [no headlocks]) provides a more comfortable environment (and thus improved animal welfare) over pasture with shade trees. Besides the harsh heat and humidity, the pasture-based environment yielded sore feet, primarily due to small pasture rocks causing bruised feet. Better cow comfort resulted in increased dry matter intake, milk quality, animal health and milk production. Before the move, the herd averaged 22,000 pounds of milk annually, with an average somatic cell count ranging from 300,000 to 700,000 cells/mL and a significant number of clinical mastitis cases from July through October. Now, SCC generally runs less than 200,000 cells/mL. Improved animal health helped improve milk quality but so did cleaner cows. Under Hillcrest’s pasture model, muddy cows frequently entered the milking parlor, which required extra washing time to attempt to remove the mud. The result? Unit on-time averaged 6.5 minutes. Today, unit on-time averages less than four minutes. And, the rolling herd average jumped to 31,000 pounds of milk. Hillcrest Farms was the first Georgia dairy to exceed 100 pounds of milk per cow per day. Activity collars help with heat detection and health monitoring. If needed, cows are sorted into a management pen after milking. This allows for AI breeding, pregnancy diagnosis and/or health treatment. Typically, they do not use estrous synchronization tools or protocols. The dairy’s annualized 21-day pregnancy rate is 25 percent. With an eye on improving this figure, the family plans to boost dry cow heat abatement. While labor concerns may be the primary reason for considering robotics, such as automated milking systems and automated calf feeders, dairies adopting robotic technologies typically realize animal welfare improvements, also. Plus, dairy producers can expect higher levels of fertility and milk quality. As a dairy production specialist for Zoetis, Natalia spends her days consulting and collaborating with dairy farmers, dairy employees, veterinarians and nutritionists. Her duties include designing, implementing and monitoring tailored solutions for challenges that dairy operations face. Ultimately, these solutions help increase dairy farm profitability and foster healthy food production. Natalia primarily focuses on transition cows, reproduction, genomics and calves. Trained as a Doctor of Veterinary Medicine, Natalie completed a cattle reproduction internship at the Universidad Nacional de Colombia. Next, she served as a dairy consultant for a reproductive technology company and then as the manager and veterinarian for a grazing dairy operation. Later, she ventured to the United States to complete a residency program in food animal reproduction and herd health, and a master’s degree in preventive veterinary medicine at the University of California, Davis. In 2015, she completed a doctorate degree in animal sciences at the University of Florida. Reflecting on her decade-long involvement in DCRC, Natalia feels the most important contribution of DCRC is the ability to effectively translate academic research into applicable concepts and management practices that can be implemented and adopted in the real world. “The main avenues for disseminating information is through the DCRC Annual Meeting, live webinars and a vast amount of resources available to members on the DCRC website,” she said. Personally, Natalia has gained valuable information and access to industry experts through her DCRC involvement and annual meeting attendance. What are the major highlights for her? With current dairy cattle fertility protocols, it is feasible to consistently achieve pregnancy rates more than 30 percent. A smooth transition period is critical to improve reproductive efficiency. Genomics plays an important role in fertility. Mark your calendar for the next Dairy Cattle Reproduction Council (DCRC) webinar – Feeding Strategies to Support Health and Fertility During the Transition Period. José Eduardo P. Santos, University of Florida, will lead this webinar, scheduled for April 26 at 2 p.m. Central time. DCRC’s highly regarded webinars offer access to high-quality information and interaction with industry experts to attendees from across the United States and around the world, all from the comfort of their farm or office. The webinars feature top-rated topics from the 2018 DCRC Annual Meeting.